When you are healthy, you don’t often find yourself thinking about your heart. Although that heart works tirelessly day in and day out, it can be easy to forget the heart is even there. It’s just an organ inside your body that you occasionally feel if you get nervous or sprint up the stairs, but it is otherwise taken for granted. 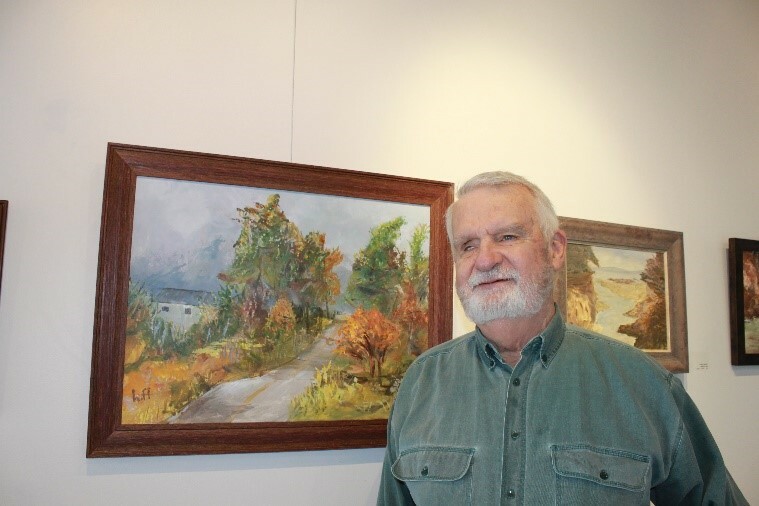 Wayland Moore, a world-renowned artist and survivor of triple-bypass surgery, received cardiac rehabilitation at the Emory HeartWiseSM Risk Reduction Program in Atlanta, Georgia in 2010. He was incredibly grateful for the doctors and the medical HeartWiseSM team who helped him and his peers. However, during his recovery, he felt something was missing from the process. As an artist, Moore was looking for a way to rehabilitate his mind and soul after the major medical event he had experienced, so that he could fight the depression he faced day after day. Finding no opportunities for creative exploration within his traditional medical care, he decided to create the opportunity himself. In 2010, Moore started an art class at the HeartWiseSM Risk Reduction Program to provide a new opportunity for cardiac patients. “Art with Heart” is for individuals who are in the process of or have completed cardiac rehabilitation. As the artists in his class discover their new limitations and adjusted capabilities, they also have access to a new and exciting type of rehabilitation that channels creativity and provides a fun and supportive community. An Art with Heart class observes Wayland Moore critique one of the participant’s pieces, making suggestions for improving the perspective of the piece. As a teacher, Moore fosters creativity and emotional growth in others who have suffered a major cardiac event. In turn, the class is a valuable continuation of his own rehabilitation. Anyone who observes the class can see that Moore enjoys helping the participants learn to intertwine art with their rehab experiences. 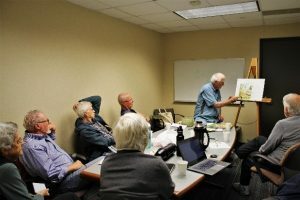 The participants enjoy his generosity week after week, as they continue on their own paths of healing, and of self-exploration as budding artists. At this writing, the class includes 10 participants; each one smiles, laughs, and shares supportive energy peer-to-peer. Each week prior to class, participants prepare a piece of art on any topic they find inspiring. They then share their pieces with the class and receive feedback from Moore and their peers. 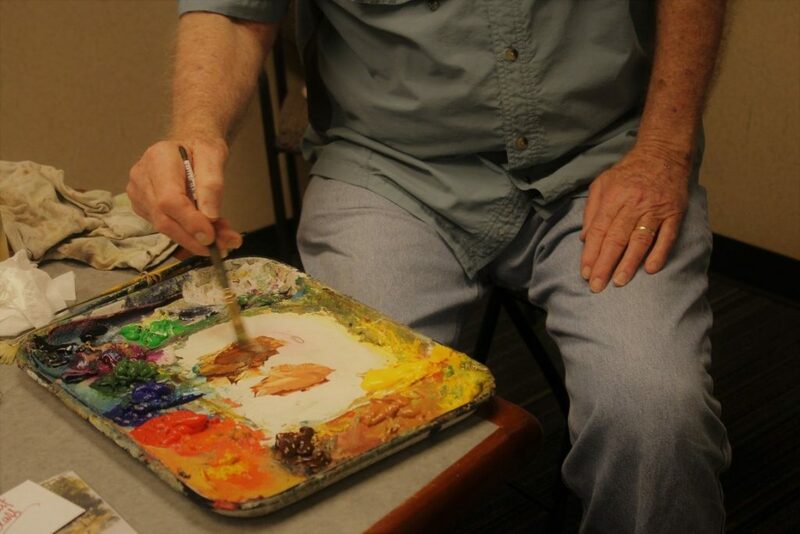 Some participants had no experience with painting before their cardiac event; yet, with Moore as their guide, many have discovered a skill they never knew they had. When Norene began the class, she claimed she had no artistic talent. When Beverly began, she said she had never before picked up a paintbrush. Now, following Moore’s guidance, Norene paints book covers and Beverly designs greeting cards. In February 2017, the entire class curated an art exhibit to present their work to the public. On opening night, the class sold 6 paintings—the proceeds of which went to benefit the artists, the class, and the cardiac rehabilitation program (HeartWiseSM) which was moved to Emory Saint Joseph’s Hospital. For the first time, the participants saw themselves as artists capable of painting something worth buying. They were able to define themselves as more than cardiac survivors; they were artists now, too. Moore explains through drawings his personal experience in cardiac rehab and the necessity of art as an outlet. Charlie Hoff suffered four heart attacks, and went through two angioplasties and a coronary bypass before being diagnosed with heart failure in 2010 (C. Hoff, personal interview, March 5, 2017). Soon after his diagnosis, he required an implantable cardioverter-defibrillator (ICD) for his continual ventricular tachycardia. Eventually, Hoff’s doctor suggested he be evaluated for a heart transplant. He was shocked. He found it very hard to grasp that he would get a heart that had belonged to another person. During this time, his family was in dire financial straits. The economy was bottoming out; Hoff was the director of a failing community bank. He was about to lose the family house when his doctor finally said, “We can’t wait any longer.” Hoff had to just pray that everything would fall into place. On August 1, 2010, he was admitted to the coronary care unit (CCU) at Emory University Hospital. He was on the 3rd floor, in room 307, for 53 days while he waited for a heart. When he finally got a match and underwent surgery, his friends and family waited anxiously for good news. Three days after surgery, he woke up in the intensive care unit (ICU), and started his road to recovery. When Hoff woke up, he could immediately feel the difference his new heart made. He had been deprived of a good supply of blood for so long that he had forgotten what “normal” felt like. Breathing was suddenly easier, he could sense the oxygen coursing through his body, and his heart felt “lighter.” He had lost 60 pounds and a tremendous amount of muscle mass through the weeks leading up to the transplant. However, he was determined to gain his life back. When Hoff was able to begin rehab, it became his full-time job. 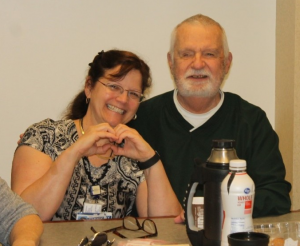 Although cardiac rehabilitation is hard work, many patients make a lot of close friends during its course. The people in the rehab gym became Hoff’s community, which he affectionately described as “his people.” One of his new friends, Jack, told him about an art class he was in with a fellow patient, Wayland Moore. When Hoff saw the sign-up sheet for the art class he thought, “You know what? I should do that.” Six years later, he cannot fathom how his life would be now without the joy of painting in it. One night, before his transplant, Charlie Hoff was at a concert with a friend and his heart pump batteries began to run low. He had to walk home and change the pack to avoid initiating an arrhythmia. He tried to explain what was going on, but his friend appeared put off by the situation. Hoff felt isolated, lonely, and depressed due to his illness and the lack of understanding from others. In art class during his rehabilitation, however, everything felt different. Hoff was surrounded by people who understood his condition and what he had been through. They saw him as a human being rather than a diagnosis. The class served not only as a creative outlet, but also as a social network of individuals who understood the struggles he was facing. Painting became something Hoff could do—a way he could express himself—without causing strain on his healing heart. With Moore’s instruction, the camaraderie, and the encouragement of the class, he was able to grow personally. He found himself observing things differently than he had before his surgery, as if he were preparing to paint how the clouds looked each day—how the light today compares to that of yesterday, and the colors of the trees change. The class was the new spark in Hoff’s life that had been missing, and proved to not only be a vital part of his recovery from heart surgery, but also a crucial outlet for his personal growth. On the days he wasn’t allowed to attend rehab due to infection, he could still go home and paint. He could continue to work toward a goal and achieve something beautiful, even if it wasn’t the initial goal of increasing endurance or strength. The opportunity to participate in the art class improved his confidence, boosted his mood, and increased his motivation to continue with rehab. For Hoff, this class has not only helped increase his adherence to cardiac rehab; it has helped him thrive and find a place in a community where he feels worthy. Hoff and his fellow painters were able to attend a “support group” without any negative stigma attached. Dr. Kathy Lee Bishop, former manager of the HeartWiseSM program at Emory Healthcare, worked with Charlie Hoff and Wayland Moore during their recovery. She remembers the day Moore approached her to ask if she could help him organize an art class. Dr. Bishop recalls being slightly taken aback. How could an art class fit into the cardiac rehabilitation program? Moore explained that after talking to his fellow patients, he realized many of his peers did not have much to do outside of rehab. He felt it was a disservice to his peers to let this continue. He told Dr. Bishop that he could stimulate the patients’ minds through art and provide them with a new productive pastime. Dr. Bishop reflected on the three e’s of cardiac rehab: exercise, education, and emotional support (K. Bishop, personal interview, September 8, 2017). Upon further reflection, she decided the art class fit into the “emotional” arm of the mission of cardiac rehab. She agreed that providing a creative outlet could improve participant camaraderie. A patient will only succeed with cardiac rehab if all three e’s are met; the class proved to be an exceptional supplement to ensure that each member received the emotional support they required. The HeartWiseSMstaff has always strived to make the cardiac rehabilitation program patient-centered; the Art with Heart class is an extension of that goal. The emotional needs of a cardiac patient are difficult to measure, but are just as crucial to a patient’s recovery as their cardiovascular vitals. Both the HeartWiseSM program and the Art with Heart classes are two ways that physical therapists can utilize adjunct programs to address the social support and emotional needs of their patients as they go through recovery. Providing opportunities for patients to engage in the humanities can offer essential outlets for rehabilitation of the body, mind, and soul. Researchers may soon determine that doing so is paramount to improving healthcare. 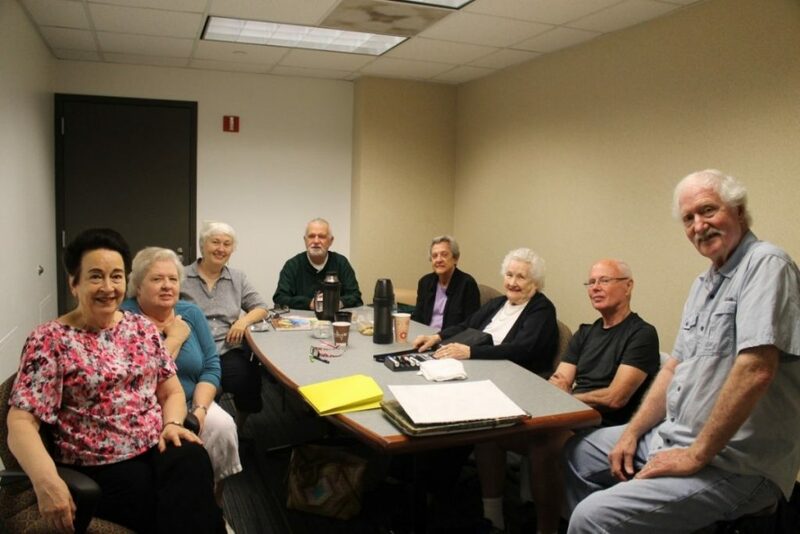 At the Emory HeartWiseSM Risk Reduction Program, Art with Heart has filled the void of isolation for a small group of patients who have found that art and friendship truly fill their hearts. Left to Right: Beverly Donaldson, Amanda Bell, Trudi Dido, Charlie Hoff, Norene Craddick, Virginia Deadwyler, Gary Hall, Wayland Moore. In an aging world, where experts predict that by 2050 40% of the US population will be over 65, it is increasingly important that we find ways to improve the health of the geriatric population.3 The elderly population is more likely to suffer from chronic and debilitating illnesses, including stroke, heart attack, cardiac failure, and dementia.3 While continuing to provide the best medical treatment, the medical community must begin to recognize social and emotional resources as equal components of patient-centered care.4 With reports of up to 40% of cardiac patients suffering from depression, it behooves the medical community to alter our practices to encourage personal and emotional support for our patients.1 Although physical therapists provide irreplaceable health services, providing social support and artistic outlets to encourage emotional and spiritual growth is not always a primary goal of intervention. In order to facilitate the best possible outcomes for our patients, perhaps we should encourage the formation of special-interest groups that can provide support, encourage growth, and build confidence in times of need. As we reflect on these phenomenal aspiring artists with a need for oxygen and for living life to the fullest, I ask a simple question: What can we do to strengthen both? This article could not be possible without Charlie Hoff, who dedicates his time every year to discuss his experience with Cardiac Rehabilitation with the Doctorate of Physical Therapy students at Emory. His passion for teaching is made evident through his dedication to the students in our program. I feel so grateful that he was willing to share his story with me. A special thanks to Wayland Moore for enhancing Cardiac Rehabilitation, as well as taking time to listen to my questions and share his story with me. Bishop KL. Why Cardio Pulm? PowerPoint presentation presented at General Medical Conditions. Jan 18, 2017; Atlanta. Smith D. What is Aging? PowerPoint presentation presented at Growth Processes. Oct 12, 2016; Atlanta. 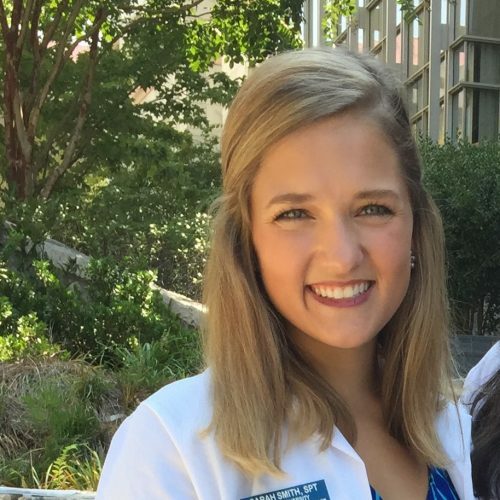 Sarah Smith, SPT, is a second year Graduate student at Emory University in Atlanta, GA. At Emory, Sarah studies Physical Therapy and has found a special interest in the inpatient neurology setting, as well as the impact of health and disability on patients’ lives and daily experiences. Sarah is Vice President of her class, and serves as a care partner for a gentleman in her community. She is currently completing her clinical rotations across the United States, and plans on pursuing a residency in Neurological Physical Therapy, with a special interest in Brain Injury Rehabilitation. Kathy Lee Bishop, PT, DPT, CCS, received her BS in Physical Therapy from the University of Vermont and her MS and DPT from the MGH Institute of Health Professions in Boston. She is a board certified cardiopulmonary specialist (since 1993), an ACLS instructor, and is the former Manager of the Emory HeartWiseSM Risk Reduction Program. An important mandate of the rehabilitation professional is to foster constructive dialogue among patients, families, and caregivers as to create a space where understanding and healing are promoted synchronously. In support of this, my aim here, as a Catholic bioethicist, is to underscore the centrality and relevance of healing in the ministry of Jesus as a rich resource for Christian patients and their caregivers, who accompany one another in the pursuit of meaning-making and the preservation of personhood when experiences of illness or disability become life-changing. No definition of disability is spelled out in the Gospels. However, the healing narratives offer a glimpse into a time, not unlike ours, when those who were different—specifically, those who individually (or as a collection of individuals) ceased to demonstrate those capacities and comportments that were thought to be constituent of personhood—were excommunicated. That is, they were excluded or removed from the community of living persons because of their ostensibly blatant association with sin, impurity, uncleanness, demons, or some combination of these. In a culture heavily defined by category, those who did not fit had to be cast out or, at least, distanced in such a way that whatever threat they posed appeared to be adequately mitigated. Of course, biblical representations of disability—including “otherness” and non-conforming bodies in general—often reveal more about the value orientation of the one(s) doing the stigmatizing than of those who are on the receiving end. To speak of the “afflicted”—such as those suffering from leprosy, (Mark 1.40-45; Luke 17.11-19)—as unclean, impure (ie, “out of place”),4(pp158-159) and, therefore, polluting, suggests that it is the state of the person that is problematic and not simply what actions they can no longer accomplish due to their condition. In this way, disability is determined by whether or not one is perceived to exist in a disvalued state, which, in turn, is based on a comparison of bodies. To be sure, those who are healed in the Gospel narratives are rarely named, but are, for the most part, introduced to the reader by a description of their bodies, accentuating what it is about the body that falls short of the ideal. This is what we learn, for example, about the “man with the withered hand” (Matt. 12.9-14), the “bent-over woman” (Luke 13.10-17), the “bleeding woman” (Mark 5.25-34), the “leper” (Mark 1.40-45; Luke 17.11-19), and the “paralyzed man” (Mark 2.1-12). It would be remiss, however, not to recognize that one’s ability or inability to function—which is sometimes connected to the nature of the disability in question—is tightly bound to the value accorded to one’s state of being. For this reason, disability seems to be interpreted in the biblical texts as a category akin to illness in its reference to “the social and personal perception of socially disvalued states”4(p156) that are recognized in the “shortcomings” of the body. I think here, in particular, of the account of the man who “had been ill for thirty-eight years” in the Gospel of John whose condition made it impossible for him to physically get up and bathe in the healing waters of the Pool of Beth-zatha (John 5.1-18). When Jesus asks him if he wants to be made well (the fact that Jesus asks this question and does not simply assume the answer is telling in and of itself), the man responds: “Sir, I have no one to put me into the pool when the water is stirred up; and while I am making my way, someone else steps down ahead of me” (John 5.7). Pilch speaks of this as the man’s “admission to colossal cultural failure.”4(p13) Presumably alone and without help, his is a disvalued state, and it is one that is linked primarily to the fact that he has been rendered unable, not only by his condition, but, more poignantly, by those around him, to do what the other “invalids—blind, lame, paralyzed” (John 5.3)—were able to do. As an aside, it is also evident here that dependency is denounced as evidence of disability rather than as a general characteristic of the human condition. Jesus turns this reasoning on its head. So, too, does Jesus challenge conceptions of the ideal/standard body; the Suffering Servant, as Jesus is called, is resurrected in the flesh with the wounds of his crucifixion intact. It is by these wounds, we are told, that the Apostle Thomas (often called “the Doubter”) comes to identify Christ and confess him as Lord (John 20.24-29). This pairing of function and value has important parallels in contemporary Western culture, especially regarding the moral status of personhood. Distinguishing “human being” from “person,” the ethicist James W. Walters underlines two fundamentally different traditions in personhood theory: physicalism and personalism.5 A physicalist, he explains, finds the essence of a person in his or her biological make-up: “all humans are persons, ipso facto.”5 The personalist, on the other hand, “sees the essence of a person as being located in one’s mental capacities and ability to use these in satisfying ways; whether one is a human is not important.”5 This latter approach to the category of person—one who is afforded protection by moral norms—is mainstream in spite of the fact that the debate over what, specifically, these cognitive properties are (self-consciousness, rationality, communication, etc.) continues to ensue. In this view, a human being, therefore, can be depersonalized if he or she experiences a sudden or gradual loss of said functions (or from the get-go if he or she was not able to perform these functions in the first place). In other words, in this case, one’s moral status (a valued state) is primarily contingent on one’s abilities. In the healing narratives, Jesus is much less interested in the nature of the physical condition and in curing than he is in granting the seeker’s request for healing as a means to restore social and personal meaning.4(pp155-156) Jesus’ involvement and, specifically, his touching of the one seeking out his power to heal “reduces and removes the experiential oppressiveness associated with such afflictions. In all instances of healing, meaning is restored to life and the sufferer is returned to purposeful living.”4(p14) That is, in these encounters, healing is the return to a re–valued state—a state judged to be so by the one who is healed and by those looking on. Interestingly, healing of this sort is not simply relegated to those who have a certain physical condition. The story of Zacchaeus, the tax-collector (Luke 19.1-10), the woman caught in adultery (John 8.1-11), Peter after his triple denial of Jesus (John 21.15-19), and others are strong examples of Jesus’ mandate to heal beyond those who were sick as a way to restore (often publicly) meaning-making relationships. A community that is “one body with many members” requires a strong dedication to this effort to remain intact. It is important to pause for a moment to underline the physicality of Jesus’ healing ministry, which often defied social convention.7 Touch can be “a parental gesture of caressing, a sympathetic gesture of caring, a professional gesture of healing, a spiritual gesture of communion, or even a political gesture of solidarity.”7 An emphasis on these last two connotations—touch as an act of radical inclusion that is also a spiritual and political gesture of solidarity—is key here. Otherwise, it could be implied that Jesus’ intention was to simply “fix” the body in order to liberate the person from “the shackles of limiting disability” so that he or she could reclaim those necessary functional pre-requisites of personhood and rejoin the community that denounced him or her in the first place. Although there is no denying the many negative interpretations of disability in the Scripture (as an impediment, as an object of charity, as the result of sin, as something to be freed from, as a means to other ends, as unclean, as polluting, as something that excludes), the re–affirmation of personhood is a crucial—although not always glaring—underlying theme. I say re–affirmation and not restoration here because even though the return to function (or to a certain corporeal standard) that indicates healing has indeed occurred seems to suggest a personalist worldview, Jesus intimates that personhood was never lost despite the judgment of observers to the contrary. The dignity of persons is rooted in the principal tenet of theological anthropology that understands all human beings to be made, unconditionally, in the image and likeness of God (Gen. 1.26-27). If the picture of disability in the Gospels often reveals more about the value orientation of the one(s) doing the stigmatizing than of those who are on the receiving end, the act of—and the intention behind—healing compels a value re-orientation of those bearing witness to it and of the one who is healed (as he or she may very well have been convinced by others as being valueless). This can be seen, for example, in the story of the man born blind in John’s Gospel (9.1-41); it is this unnamed man who alone sees Jesus as more than just an ordinary healer. The observers, who had physical sight all along, are perplexed by the healing of the blind man. Some wonder whose sin (the blind man’s or his parents’) was to blame for his condition. Others interrogate the blind man, but, dissatisfied by the answers they receive, end up bypassing him completely—a clear affront to his autonomy—and probe his parents for clarity. The struggle to categorize the blind man by attributing to him some corporeal deviance that is defined by “cultural rules about what bodies should be or do”8 (in this story, by way of confirming that sin corrupts the flesh) fails time and again, as the thought-to-be characteristic elements of the category crumble. Alas, Jesus’ desire for value re-orientation does not come to pass here. “I came into this world for judgement so that those who do not see may see,” he says, but, in the end, those with physical sight seemingly learn nothing in their witness of this particular healing. It becomes obvious to the reader, however, who in this scenario is actually impaired (John 9.39); perhaps this is the more urgent intention after all. “Constructed as the embodiment of corporeal insufficiency and deviance,” Disability Studies scholar Rosemarie Garland-Thomson says, “the physically disabled body becomes a repository for social anxieties about such troubling concerns as vulnerability, control, and identity.”8 While the healing narratives show Jesus working within the framework of a culture that is quick to excommunicate the non-conforming body (indeed, most healings involve re-conforming the bodies in question), he draws out these social anxieties and transcends them by touching, relating to, and re-affirming the personhood of those cast out. In the drama of the Passion at the end of his life, the construction of Jesus as an embodiment of deviance comes to a point. He himself becomes a physically disabled and dependent body, a repository for social anxieties, and a vision of vulnerability destined for an obliteration that would require—and still to this day commands—beholding. This is the one whom Christians—patients and caregivers alike—are called to embrace. Kinsley D. Health, Healing, and Religion: A Cross-Cultural Perspective. Upper Saddle River, NJ: Prentice Hall; 1996:1-2. Case SJ. The art of healing in early Christian times. Relig. 1923;3:253. Ferngren GB. Early Christianity as a religion of healing. Bull Hist Med. 1992;66:1-15. Pilch JJ. Healing in the New Testament: Insights from Medical and Mediterranean Anthropology. Minneapolis, MN: Fortress; 2000:12-13. Walters JW. Is Koko a person? Dialogue 1997;9(2). Available at: http://dialogue.adventist.org/09-2/walters/is-koko-a-person. Accessed Oct, 18, 2016. Furnish VP. 1 Corinthians. In: Meeks WA, ed. The HarperCollins Study Bible: NRSV. New York, NY: HarperCollins Publishers; 1993:2157. McColl MA, Ascough RS. Jesus and people with disabilities: old stories, new approaches. J Pastoral Care Counsel. 2009;63(3-4):9. Garland-Thomson R. Extraordinary Bodies: Figuring Physical Disability in American Culture and Literature. New York, NY: Columbia University Press; 1997:6.